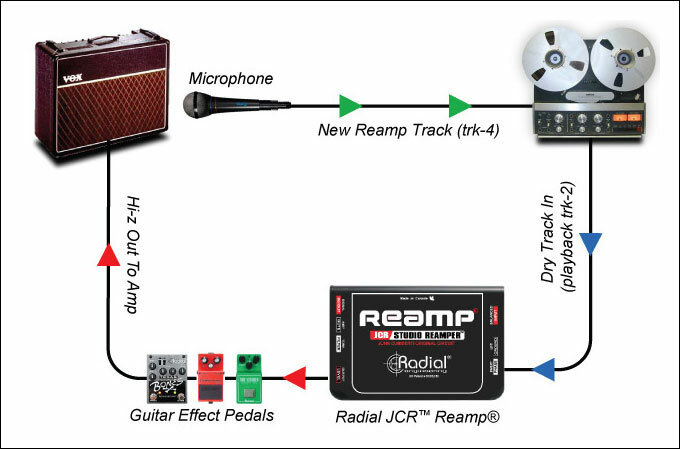 As there are so many different possible setups for your electric guitar, Radial has created the Electric Guitar Roadmap to help players visualize possible solutions. The traditional method of getting the sound of the guitar to an audience is to place a Shure SM57 in front of the speaker on the amp’s cabinet. While this certainly sounds awesome and is a tried-and-true method for most applications, the advent of personal monitoring systems like Shure’s PSM 900 led to guitarists being dissatisfied with the sound they were hearing in their in-ears. With the microphone method you are hearing the microphone, not necessarily the amp. This reality was the inspiration behind the creation of the Radial JDX 48. It would not be a lesson on electric guitars and DIs without mentioning Radial’s JDX 48. This DI box, designed to be positioned between an amplifier’s head and speaker, allows for the direct amp sound to travel to the PA and monitors for a more realistic snapshot of the guitar tone. The magic occurs as the JDX 48 is wired to capture both the signal coming from the guitar amplifier head and the back-electromotive impulse from the loudspeaker. The JDX 48 also allows for 100% consistent tone between shows which is impossible with the many variables related to microphones. Live sound engineers found that combining the sound of the JDX 48 with a microphone on stage led to an incredible tone, but also required the use of a phase-alignment tool such as the Radial Phazer. The engineering team at Radial simplified this set up with the creation of the Radial Headload. 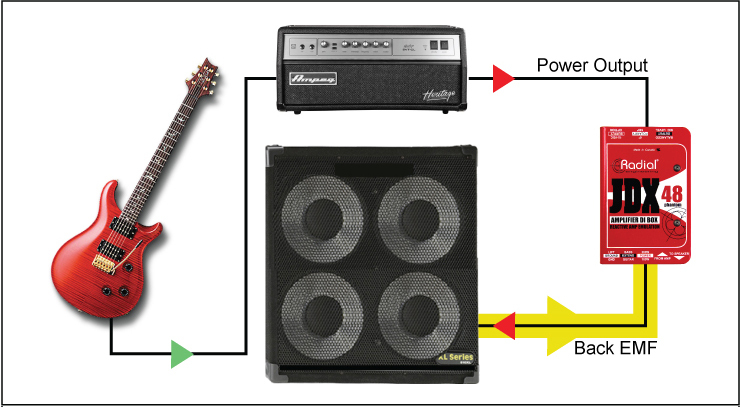 The Headload may be the ultimate tool for gigging electric guitarists. It has the same features as the JDX 48, but allows the player to adjust the phase of their signal to be matched with a microphone and comes with equalization controls to further sculpt the sound of their direct signal. Most importantly, the Headload is a “load-box”, meaning that it can absorb the energy of the amp’s head and produce a lower volume through the amp’s speakers. This is crucial, since most guitarists only like the sound of their amp when it is driven hard at high volumes. Unfortunately, amps being pushed to their full volume is not as enjoyable for the audience. The Headload also allows guitarists to play through their favourite sounding amp heads without even needing guitar cabs! Having spent years developing the JDX 48 and Headload, it only made sense that Radial would develop a solution for guitarists who didn’t want to use an amp at all; hence, the JDX Direct-Drive™ was born! The Direct-Drive lets guitarists choose between three different amp voicings: “Combo”, “Stack” and “JDX 4×12”, with further controls to adjust the brightness of the amp. 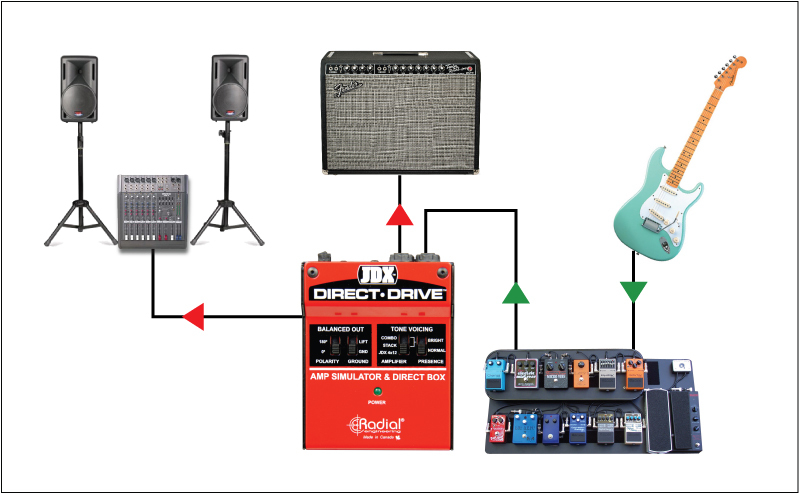 The guitarist simply plugs in their guitar through their pedals, into the JDX Direct-Drive and out to the board with an XLR cable. There are additional outputs for attaching to onstage amps or speakers as well for guitarists who are more comfortable having volume with them on stage. The engineer can then mic the amp and mix the two signals together to get the best tone out of the PA system. A common issue for playing on larger stages or in studios is the distance between a guitarist’s pedals and their amp. Guitar cables that are longer than eight or nine meters (25 or 30 feet) not only degrade the quality of the signal, but also become incredibly susceptible to noises like hiss and hum. To allow guitarists to drive their signal over 100 meters (300 feet), Radial created the SGI-TX/RX. The SGI changes the unbalanced guitar signal to a balanced line-level signal, altering the impedance for longer XLR cable runs; guitarists are able to use their amps offstage or in an entirely separate room when trying to craft the perfect tone. Reamping was originally invented as a creative tool. Instead of spending hours crafting the perfect guitar tone before hitting record, the dry signal from a DI is recorded and later “reamped”, saving time and letting the guitarist focus on nailing the performance. This allows the engineer to send the recorded dry signal through guitar amps or tone shaping devices during post production, eliminating the need for the guitarist to be present. To capture the best “dry” performance, an active DI such as the Radial J48 is recommended as it produces more level which is useful for standard guitar pickups. As a rule of thumb, when using a passive instrument, select an active DI and when using an active instrument (such as a bass with powered pickups), a passive DI should be used. The DI makes the guitar signal suitable for recording by changing the impedance and converting it to a balanced signal. For a more affordable option there is the Radial Pro48 which uses Eclipse transformers, while the JDV MK5 is Radial’s flagship DI and can be optimized for any instrument. A Reamp box is essentially the reverse of a DI box and converts a balanced signal into an unbalanced signal suitable for driving guitar amps. Radial makes three different versions of this device with variations in features and in quality of the transformers. For an introduction to reamping there is the passive ProRMP, for high quality reamping there is the Reamp JCR, and at the top of the line is the dual-channel active X-Amp. Finally, there may come a time when a guitarist desires multiple guitars and amps to run simultaneously. The JX62 allows you to use six instruments at once and drive up to four amps. It also employs two built-in DI boxes and an optional ABY footswitch to change between amps. The JX44 Air Control allows up to four guitars and six amps to be used at once, as well as a built-in Radial DI, an SGI interface for longer cable runs, and an X-Amp to make the reamping process incredibly efficient. No wonder it won the Music Players ‘Wish I Had One’ award! Pair it with a Headbone amp head switcher and the JDX 48 for the ultimate in control and consistent tone night after night.